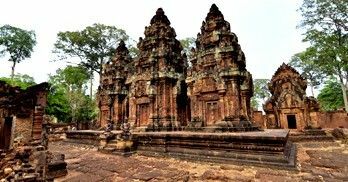 This temple built by Jayavarman VII has 54 towers and features 216 faces situated at the center of Angkor Thom. According to the widely accepted theory, the faces found on the tower structures are said to be that of a bodhisattva (an enlightened Buddhist) named Avalokitesvara. But others suggest that they could be of Jayavarman VII, considering the likeness of his facial features matching the faces found on the towers. 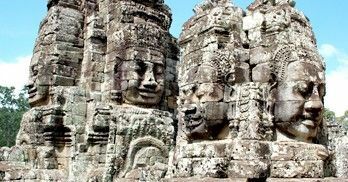 The splendor and colossal scale of face structures with alluring smiles pronounce unfathomable meanings while the creepiness of being watched makes the Bayon stand apart from the other ancient sites. Though predominantly considered as a Buddhist site, this temple has various Hindu elements as part of its architecture. 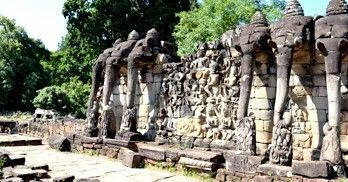 Similar to Angor Wat, this temple is place to some exquisite bas relief corridors portraying historical events of significance. This is a vast platform covering a distance of nearly 1000 feet that primarily served the purpose of a viewing stand for the royals during ceremonies. 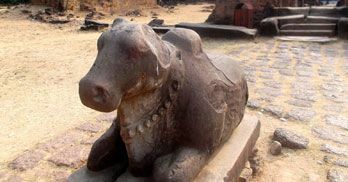 One can see five staircases leading their ways up to the ten meter high platform flanked by Airavata (the three-headed elephant mount of mythological god Indra). The walls display Lion-faced chimeras and garudas alternating each other to make the place picturesque. No wonder tourists with cameras throng this place making this place buzzing all the time. Hence it would be wise to visit either early or late after the crowd subsides. This temple was built to stay perched over a man-made island situated in the centre of a huge and elaborate man-made reservoir. 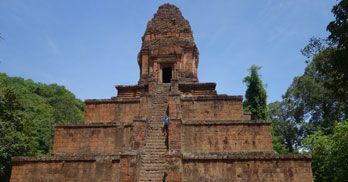 It too like Pre Rup symbolizes the mythological mountain called “Mount Meru” sans the pyramid- type tiers. 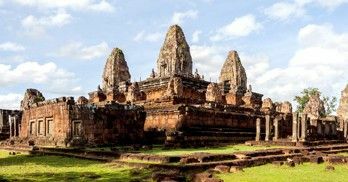 In addition to this, this temple is also marveled for its superior quality lintel carvings that have managed to stay intact braving extreme climatic conditions and other types of deteriorations over the passage of time. The landing stages found at the base level constantly reminds the fact that East Mebon once would have been accessible only by boat. 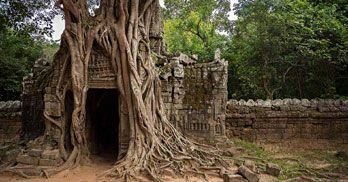 Ta Prohm gives an impression of entering a jungle with temple ruins. Though it is true in every sense, the place with iconic, humongous tree roots and labyrinth- like passageways looks captivating especially early in the mornings. Originally called as the Monastery of the king or Rajavihara, Ta Prohm was once a Buddhist temple devoted to Jayavarman VII’s mother. 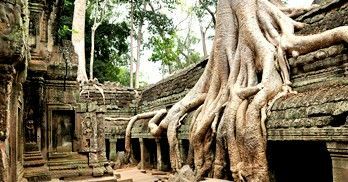 The popularity of this place soared to great heights after the film “Tomb Raider” was shot here making the strangulating tree root formation known by its nickname as “the Crocodile tree” to be known as the “Tomb Raider Tree” by all after the release of the movie. This is the very place where Lara Croft (Angelina Jolie) is seen picking a Jasmine flower before heading towards an adventurous journey. Also known as the Fortress of the women, Banteay Srei is illustrious for its intricate tapestry-like wall decorations carved on pink-hued sandstone. Though smaller in size when compared to other huge khmer artworks, archeologists hail this place a “gem or jewel”. Originally known as Tribhuvanamahesvara of Isvarapura town, Banteay Srei showcases exquisite decorations done using a sandalwood carving technique akin to Indian architecture. The carvings of gods and mythological stories of two great Hindu epics – Ramayana and Mahabaratha can be seen all along the walls and enclosures of this temple making it evident that the land was once ruled and controlled by the rulers of Indian origin. This colossal temple is a must-see wonder. King Rajendravarman is said to have built this virtual “Mount Meru” using a combination of construction materials ranging from laterite to sandstone and brick. The temple towers and walls are adorned with elaborate bas-reliefs. The steep temple terraces are worth climbing, for it gives the magnificent view of engraved guardian lions sitting on top of it apart from providing a panoramic view of the countryside surrounding the temple. During low-light conditions, one can witness the rich texture of the stones and their plush reddish tinges come to life. Hence is a popular sun-set spot among travelers. Built by Jayavarman VII, Ta Som offers wonderful image clicking opportunities for photo enthusiasts. 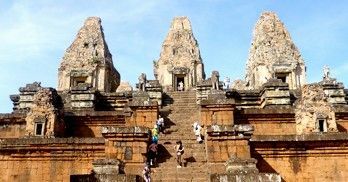 When compared to other temples found in the Angkor region, this Bayon-style temple is quite smaller in size but is full of carved wonders including large garudas (birds similar to kites), faces and serpents. The most impressive feature is the overwhelming presence of a massive tree found on the eastern side of the gopura or tower. The towers are seen to be arranged in Quincunx (“X” pattern) form with an original entry from East. Not known to many, this place can offer a peaceful environment for exploration. 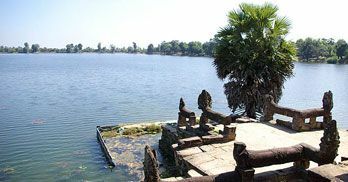 This is a man-made 900 year old lake situated opposite to the Banteay Kdei’s eastern side entrance, still serves as a water reservoir providing a spectacular sunrise view. Once known as the Royal Baths, this is now a famous swimming facility for the local children. It is a 10th century place of worship dedicated to Lord Shiva found close to the South gate of Angkor Thom built by Harshavarman I. The stepped pyramid has four tiers made of laterite that diminishes in size as it goes up. An inscription seen on the sanctuary tower’s eastern side contains this temple’s history. Consisting of interesting stonework, Preah Ko dedicated to the sacred bull or Nandhi of God Shiva is one among the ancient temples found in Siem Reap. It is also said to be the first temple built in the prehistoric city called Hariharalaya. Now, only 6 brick towers continue to exist over a sandstone base. Get weekly updates on the Tour Tips, Travel Offer right in your mailbox.